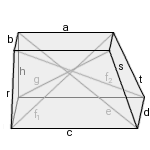 Here, a skewed cuboid is a hexahedron with two opposite rectangles, where one vertex is right above the other. One of the rectangles (here the bottom) has length and width larger or equal than the other. Other faces are right trapezoids. Front and right face are skewed. The volume is calculated from the cuboid of the smaller rectangle, two ramps and one corner. Enter length and width of the rectangles and the height, choose the number of decimal places, then click Calculate. Lengths, widhts, height and diagonals have the same unit (e.g. meter), the areas have this unit squared (e.g. square meter), the volume has this unit to the power of three (e.g. cubic meter). A/V has this unit -1.